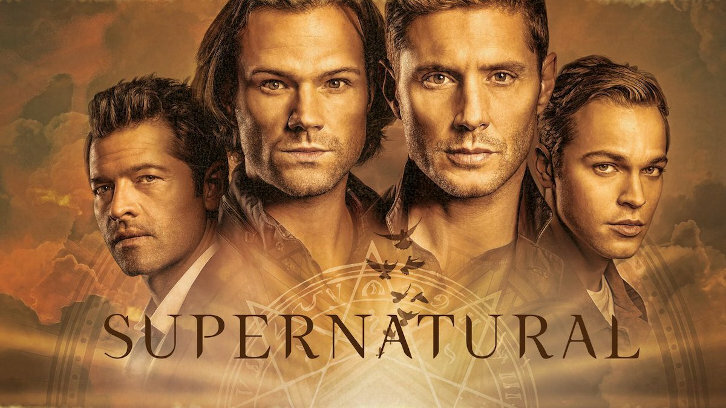 Supernatural “Unhuman Nature” was written by the team of Eugenie Ross-Leming and Brad Buckner and was directed by John F Showalter. The episode felt a bit disjointed and flat as it split its time between Jack’s (Alexander Calvert) worsening condition and Nick’s (Mark Pellegrino) worsening meltdown. The episode begins with a monologue from Nick – at first it seems like he’s taking solace in the Church. We pan out from Nick’s confusion over his feelings to the horrific sight of the Priest that he has killed and crucified. 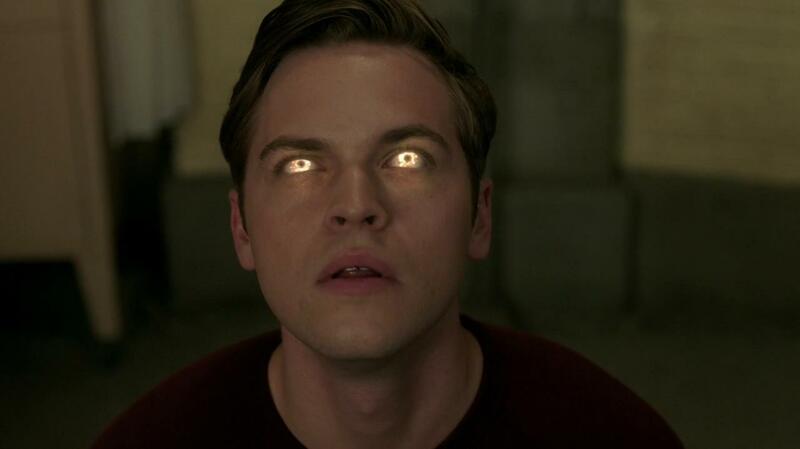 Nick is still warring with his compulsion to do evil and the fact that it feels so good afterwards – is this a by-product of Lucifer possessing him for so long or did Lucifer choose him in the first place because he’s an insane serial killer? Meanwhile, at the Bunker, Cas (Misha Collins) is having no luck making Jack better – in fact, he gets so much worse that they rush him to the local hospital. The intake interview is absolutely hysterical as they can’t give even the most basic information. Dean (Jensen Ackles) is stumped by the last name question – but Sam (Jared Padalecki) jumps in with Kline (of course!). Sam comes up with the date of birth – May 18 – and Dean stumbles over the year. 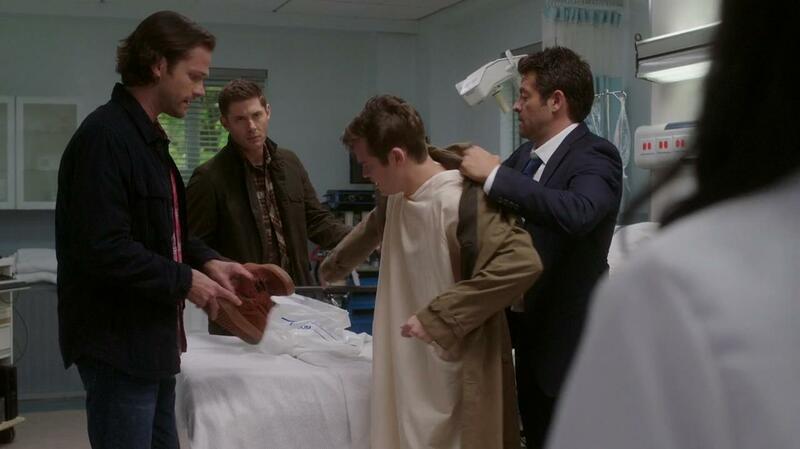 I loved Cas’s explanation of Jack’s Dad’s cause of death – he was stabbed through the heart and exploded! Bet she (Morgan Brayton) doesn’t hear that every day! To her credit, she doesn’t look very surprised! Completely unsurprisingly, the conventional hospital can’t do anything for Jack – because all of his test results came back negative. They have no idea why, but his body is in complete systemic shutdown. 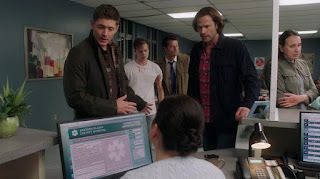 Sam and Dean decide – finally – that the hospital is pointless, and they need to “do what they do.” Dean is already ready to do whatever they have to, to save Jack – even Rowena (Ruth Connell) – and Sam’s already called her. Rowena arrives thinking that Dean is the one who is sick. She has the Book of the Damned with her, which Sam reminds her that she stole, and she reminds us that she hasn’t been back to the Bunker since all those “other people” arrived – which also makes us wonder where all the people in the Bunker have suddenly disappeared to? It seems strange for the Bunker to be essentially empty after it’s been so busy every other time we’ve seen it. Rowena is not happy that Sam has played a trick on her. She doesn’t remember Jack, but wants nothing to do with him as soon as she hears that he’s Lucifer’s son. I loved this scene as Jack overhears – and we see the look on Rowena’s face when she realizes it. Jack wins her over, by completely accepting how she feels and not trying to guilt her or bully her into helping him. He genuinely thanks her for the part she played in saving them all from Apocalypse-world. And then she’s in. Bullocks. Rowena doesn’t have good news. Jack is an “unnatural being” – neither human nor angel – and it was his grace that kept him in balance. Cas immediately offers his grace, but Rowena points out that Jack is half arch-angel and thus needs something stronger. 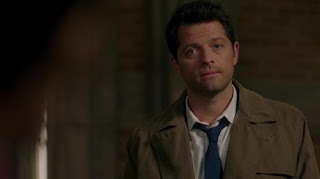 It’s while Rowena is speaking that Dean has his first “episode” – it seems completely obvious that Michael has never really left Dean’s body and has simply been bidding his time. Dean brings Jack some food to find him about to leave the Bunker to head for Vegas – remember when that was what Dean kept wanting to do? Jack tells Dean that he’s accepted that he’s no longer special and before his life is over, he wants to live it. Jack expects Dean to disagree, but he doesn’t. While Cas, Rowena, and Sam research – Ketch has suggested a shaman – Sergei (Dimitri Vantis), Dean tells them that he and Jack are taking Baby for some exercise. Cas goes to see Sergei. And this sets us up for some terrific scenes with Ackles and Calvert – and it’s easy to see Dean playing big brother to Sam in the same way. 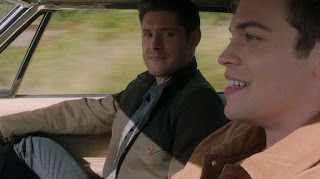 Dean actually lets Jack drive! 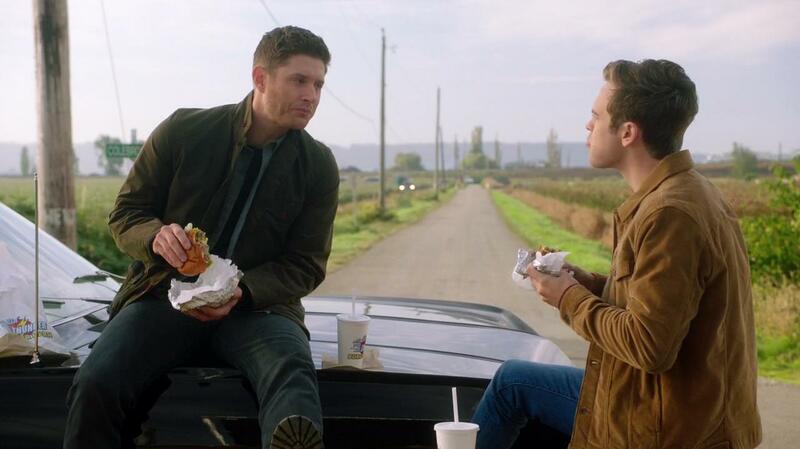 It’s hilarious when Dean’s driving advice is don’t use two feet and don’t over think it! I particularly loved this as my mother drove with two feet her entire life – and never drove a standard. We get their Baby adventure complete with some perfect classic rock – “Let it Ride” by Bachman-Turner Overdrive. It’s capped off by Jack mimicking Dean’s signature elbow-out-the-window pose. Back at the Bunker, we do get a great scene between Padalecki and Collins. They are both terrific in this scene as they discuss their worry over Dean and how he’s taking Jack’s illness. 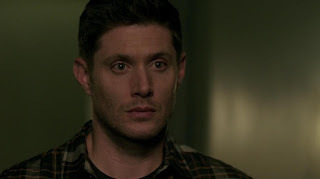 Sam points out that Dean feels badly because Dean was so hard on Jack in the beginning – Dean and guilt are old friends after all. Cas sees that Sam is also feeling the difference in losing a son – and Cas feels the same way. Jack and Dean share the requisite scene beside Baby too. Jack is thrilled – he can drive! 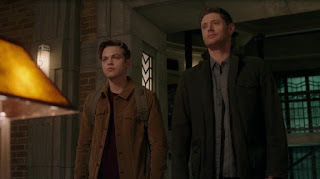 Dean suggests a hook-up joint so that Jack can get laid – but this isn’t Jack’s final tour – think Dean and the twins and Lisa and…in season three. Jack has another idea of a memory he wants to make. And again, Jack isn’t just thinking of himself. 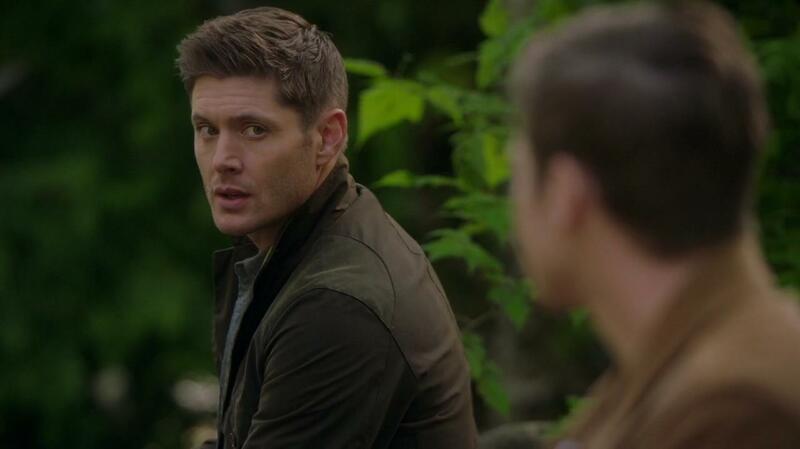 Jack wants to go fishing because Dean told him about doing it with John. Jack says it was Dean’s favorite memory of his Dad, which Dean denies saying – but Jack could tell. Of course, he could – he’s a Nephilim. Jack tells Dean that if he doesn’t make it, he wouldn’t be missing things like Tahiti or the Taj Mahal – he’d miss more time with Dean. Life isn’t about the big amazing moments – it’s time together that matters. Jack tells Dean that he’s had a good life – and it’s clear that this is the memory that Jack wants Dean to keep – of him being happy. He doesn’t want Dean to remember him with guilt. Cas tells the others that Sergei was odd but seemed legit. Jack takes in the grace while Rowena performs the spell on Jack – and it seems for a moment to have worked as Jack’s eyes glow yellow. Jack feels a definite improvement, but then he collapses. 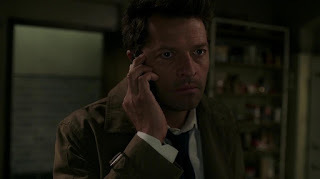 Cas tries to get Sergei to come and make it right. Sergei refuses to make a housecall – and admits that it was an experiment. 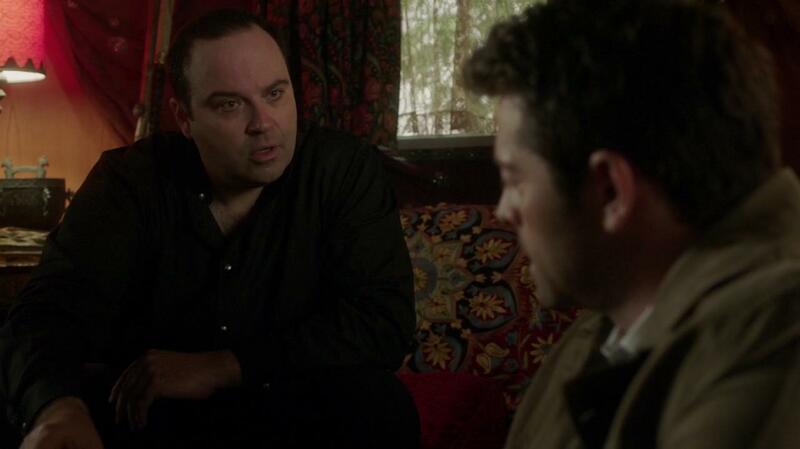 Cas vows to find Sergei if Jack dies – but Sergei doesn’t seem too worried. Diane tells him that she’s moved on – and suggests that he should too. 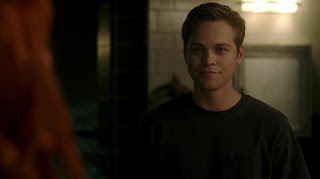 Nick tells her that he’s sure he’ll be able to once he clears the “demons” in his head by finding out what really happened. She tells him that the beat cop that night was Frank Kellogg (Craig March). There’s a seemingly pointless scene in which Nick sits outside the back door of a club. He’s trying to fight his murderous urges – it feels like that entire cliché of an angel on one shoulder and a devil on the other. Is Nick schizophrenic or is this Lucifer trying to come back? It also seems ridiculous that Madelyn (Raylene Harewood) would even talk to a strange guy in the alley, let alone invite him into the club with her – does he look like a club-dude????? In the end, Nick is able to chase her (and his demons) away for the moment. Nick then heads to Frank Kellogg’s – and he doesn’t hold his evil side back as he tries to get answers – or just scratch that evil-itch. We finally find out that when Arte told the cops he’d seen someone, they told him not to tell. Frank tells Nick that Nick’s wife had called the precinct because she’d heard a prowler. 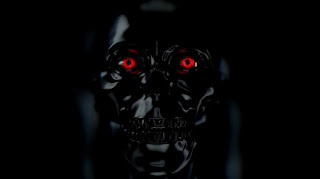 Frank was the only one to answer the call and he found a guy called Abraxis on the front walk – and the next thing Frank knows, he’s back in his patrol car covered in blood. Frank maintains that he was out of his head that night – he wouldn’t kill anyone. 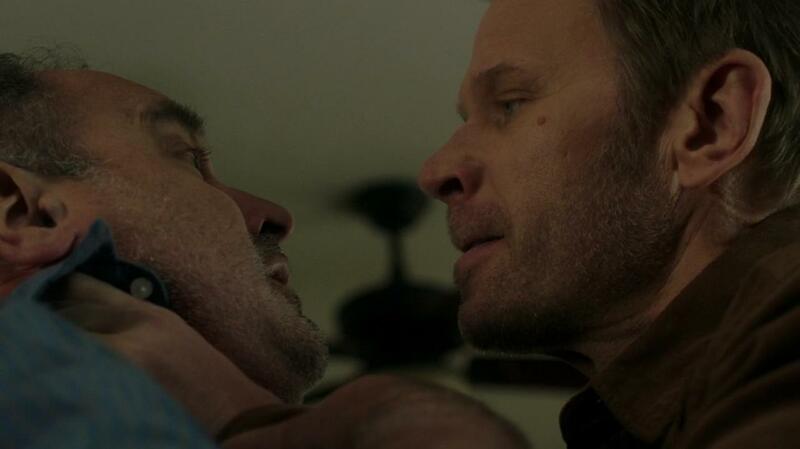 Nick knows that Frank was possessed – and that Lucifer knew the demon. Frank isn’t at fault – but it was Frank’s hand that actually did it – so Nick kills Frank. I actually really like the sound track over this which sounded like feedback – the violent feedback that seems to be playing in Nick’s head. Nick decides to try the “power of prayer.” Nick confesses that he lied about being free of his rage and violence once he found out the truth. But the truth is that he enjoys it. He confesses that he’s bonded to Lucifer – it’s why Lucifer was attracted to him in the first place. He wants to return to no feelings, no pain, no guilt, no remorse. 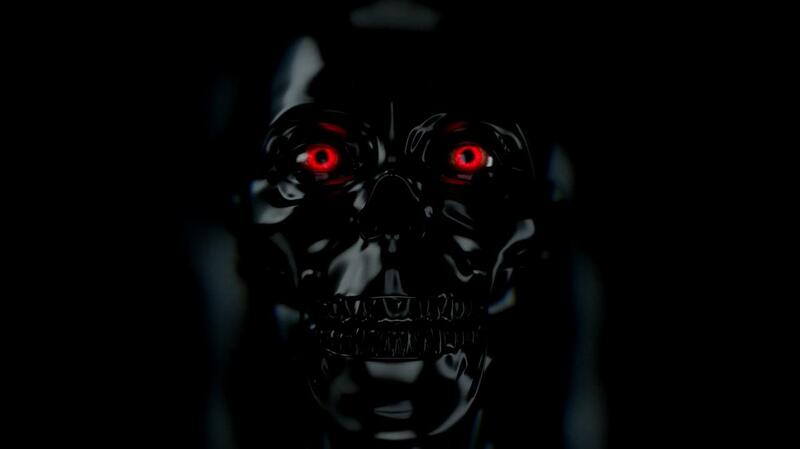 Nick is clearly praying to Lucifer to help him – and we see black skull emerge from a black pool and the eyes flash red. 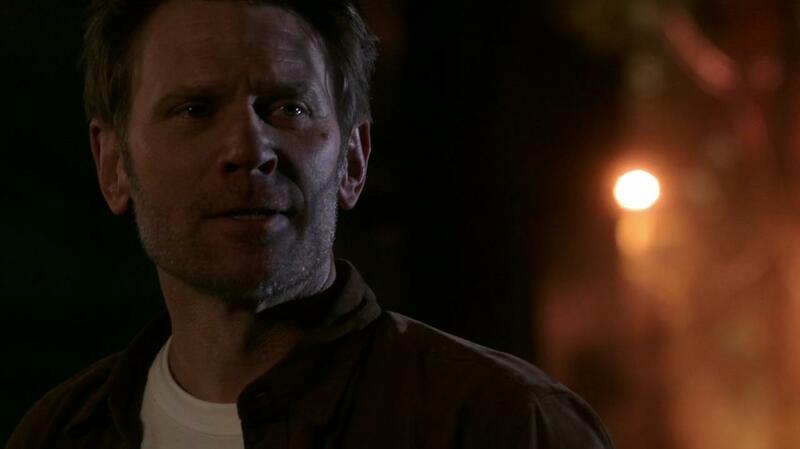 While I’m hating this tired storyline, there is no denying that Mark Pellegrino is delivering excellent performances. 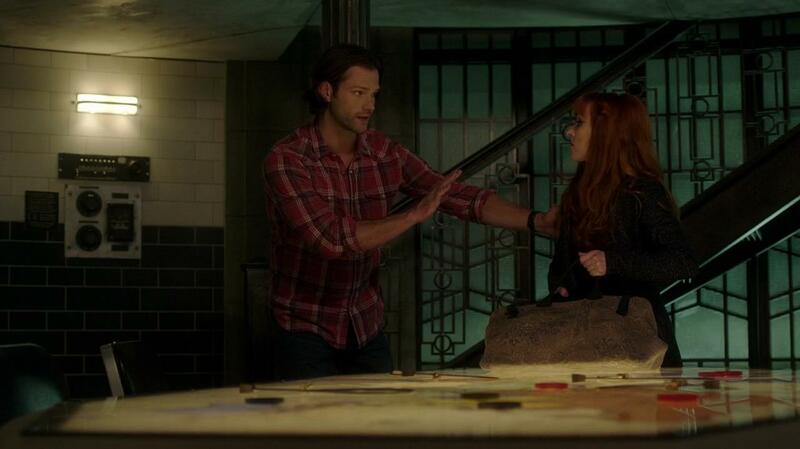 In the final scene in the Bunker, Jack is back in bed as Rowena tries to bring him some relief. 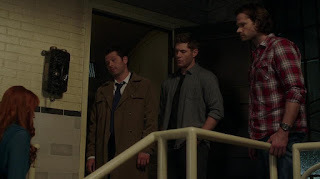 Dean worries that he’s made it worse, but Cas and Sam tell him that he did more for Jack than anyone. It was what Jack wanted. Sam points out that life itself is a risk. Rowena tells them that all they can do is watch over Jack while he dies. 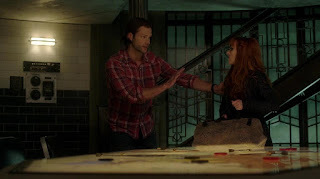 The scenes with Dean and Jack were classic, and it’s always nice to see Ruth Connell guest star, especially now that they aren’t just playing her character for laughs and we actually get to see her act. While this seemed like a bit of a filler episode, it did move us in a couple of important directions. Clearly, we’ll see Sergei again. More importantly, what is going on with Dean? 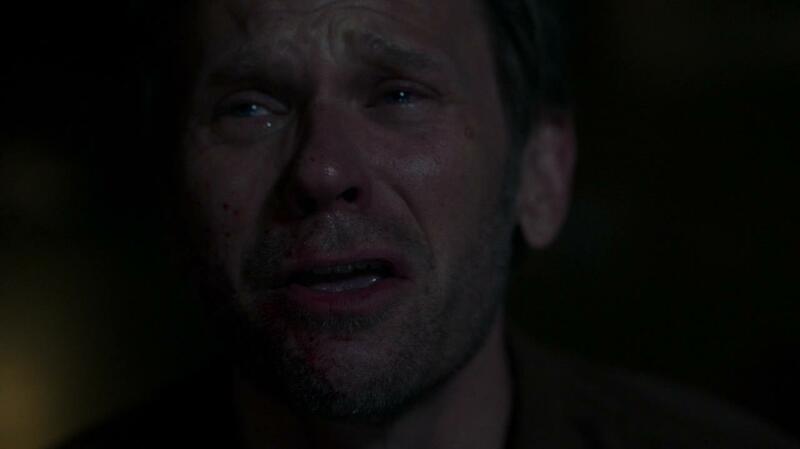 I’m betting we’ll be seeing Michael again by the fall finale – and I’m betting we’ll see Lucifer again, setting us up for that big battle Royale again. Honestly, resurrecting Lucifer is the biggest Hail Mary the show has done yet – and feels like some serious shark jumping. Clearly, dying on this show means absolutely nothing – and therefore, deaths no longer have any impact. Having increasingly bigger bads – or attempts at them – means nothing if there are no stakes. 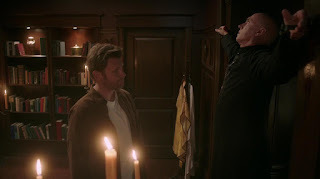 I suppose we could hand wave and attribute the whole thing to the spell that Crowley cast bonding Lucifer to Nick’s vessel? Still. Feels like a very weak plot point to me. What did you think of the episode? Let me know your thoughts in the comments below!